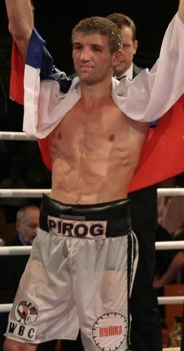 Pirog retained the WBO middleweight title when Martirosyan was retired by his corner after taking a bad beating. Campbell cut after an accidental clash of heads and it was stopped with Allahkverdiev ahead on scores of 60-55 twice and 60-56. Dimitrenko retained the EBU heavyweight title on scores of 116-111, 119-108 and 117-111. Sprott had a point deducted early in the tenth for punching after the bell of the ninth and in the 12th for pushing. Dimitrenko started well but faded somewhat in the middle rounds and became increasingly sensitive to Sprott´s punches. The Brit waited too long though and Dimitrenko got out of rough spots; The win was ok but perhaps not with numbers the judges had. End of the line for Gomez, who fighting with an injured shoulder, fought a lethargic fight while Wilson seemed to enjoy it and found a home with a wide right hook. It was scored 96-94 twice and 95-95 but looked wider. Simms seemed unprepared and was floored in the second by a left from Chakiev in this all southpaw battle. Simms took a beating to the body and was staggered in the third and then finally knocked out by left hooks to the body. Greer looked every bit like someone looking for a place to lay down but hung in there and while Boytsov scored almost at will he also hade to be careful and the fight dragged out. Greer was bleeding badly from the nose and was deadtired and staggered when it finally was stopped. 80-72 and 79-73 twice. Menzer outboxed Nunez most of the way. 60-54 on all cards. Kostin was hurt in the third from a left hook to the body. A sparring session for Tajbert. 77-75 twice, 77-76. Meyerdiercks faded after a good start and had a lot of problems in the end his awkward opponent. 60-55, 60-54 and 60-54. Bidenko had too much of everything for Dolgovs but couldn´t hurt him. One-sided, 40-36 on all cards. 4x3, h: Adam Lautenschlager, Ger KO 1 Pavel Durco, Cze ?? for vacant Finnish and BBU heavyweight titles. Seferi retained the WBO European title as Ingelrest retires with an injured hand. Morote a late sub for Ali Hallab is stopped in the fifth in this fight for the vacant EU superbantam title. Haapoja won the vacant EU title on scores of 117-110, 114-113 and 116-111. Haapoja floored Arrami in the fourth but faded in the later rounds. Shafikov, P 3 Boxing´s Russian star, won the vacant EBU jr welter title when Italian veteran Giuseppe Lauri, since a few years fighting out of Budapest, floored in the eighth, didn´t come out for the ninth. 59-54 on all cards. Butlin deducted a point in the final round for low blows.